Located on the Atlantic west coast of Ireland, the university city of Galway is rich with culture and history and is one of the nicest and most energetic cities in which to learn English! In Galway they tell you to go where the mood takes you! 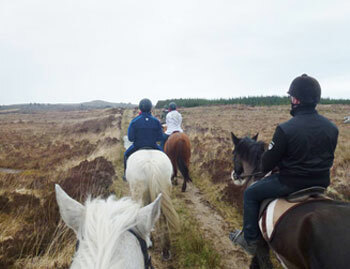 You can enjoy one of Galway’s numerous amazing festivals, walk along the beautiful coastline, discover the soulful Aran Islands or visit the great rocky wilderness of famous Connemara. You can stop in a tiny bookshop, have lunch in a traditional Irish pub and visit the aquarium, or one of the city’s many museums. 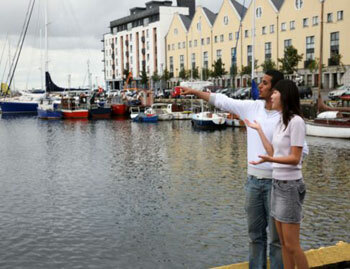 Galway is known for its bohemian flavour and the people here are relaxed, laid back and always ready to party! The city is also known for its artistic creativity and a full yearly calendar of events and festivals of all kinds. 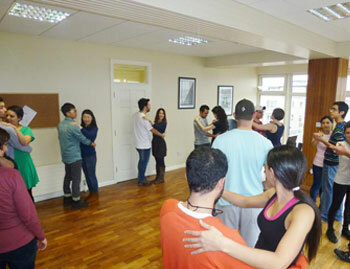 The flamboyant arts scene attracts visitors from all corners of the world. Choose an English language course at our school in Galway if you want to immerse yourself in the very best of Irish culture, whilst improving your English language skills at the same time! At our school in Galway, one of Ireland’s top language schools, we can guarantee that you will be supported and encouraged to make as much progress as possible in your English lessons, as well as outside of the classroom! The expert staff are dedicated to help you to improve in knowledge and fluency so that you will soon be using your English with confidence in all kinds of everyday situations! 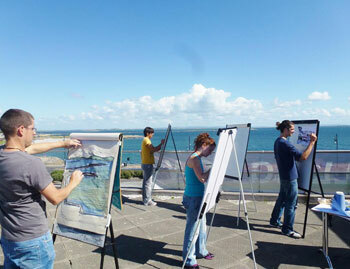 There are 16 modern and fully equipped classrooms, with some great views over the Atlantic ocean! 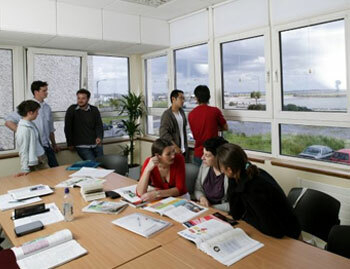 The school also has a large common room, a library, study room with resource materials, a computer room, a student cafeteria selling hot and cold food and gourmet coffee, as well as free WiFi internet access throughout the building.The school is just 15 minutes’ walk from the centre of Galway and you can start a course on any Monday of the year, to stay as long as you wish. The Intensive and Super-intensive courses, consisting of 20 or 30 classes each week, are the ideal choice for students who wish to improve all aspects of their language skills and gain fluency fast. There is a great deal of focus on communication, as well as grammar and vocabulary skills. Students with specific language needs, who wish to combine group classes with some one-to-one tuition can opt for a Combined course consisting of 26 classes in total, including 6 private English lessons each week. Choose a course of Private English lessons only, if you are looking to make maximum possible progress in the minimum amount of time, or if you need an entirely customised course. Our school offers a special 4-week Business English programme, of 30 classes per week, to teach a variety of professional and business skills and to prepare you for the world of work, or a career in an English speaking environment. A range of business modules are available such as: Advertising, Tourism & Travel or Public relations! Please contact us for further details and start dates. Students who wish to study for any of the Cambridge English Exams can choose the Exam Preparation course at our school in Galway for a duration of 6 or 12 weeks. This course introduces you to all of the exam components in detail and provides examination practise, in addition to the exam at the end of the course. There is also an IELTS Exam Preparation course, which will put you on the best pathway for access to British university programmes! All exam preparation courses will enable you to maximize your potential for the best end result! Regardless of the length of your stay in Galway, we are aware that you are looking not only for an English school, but for a place in which you can relax, enjoy yourself and a comfortable place to call home for a while! 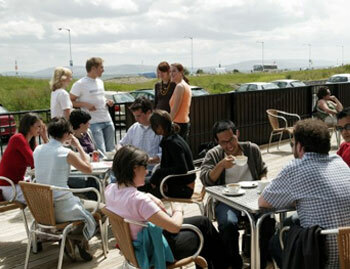 We offer accommodation with carefully selected Irish host families or in the students residence buildings. The host families are located in the lovely areas of Salthill or Knocknacarra areas of the city, juts 20-25 minutes from the school by bus. Many students also like to rent a bicycle during their stay. The residence offers students more independence in bright, modern and self-catering apartments located between 5 and 20 minutes’ walk from the school. You will have your own room and share the common areas with other international students. There is a fully-equipped kitchen to prepare your meals. The Galwegians know how to enjoy themselves and the city has a reputation for its exciting and lively vibe, which is evident every year in a packed calendar of events and festivals throughout the city and its surroundings! 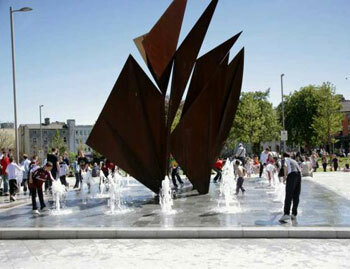 There is a party atmosphere in Galway which attracts many visitors and no matter whether you prefer to experience the Irish pubs, to go to a concert, to watch horseracing, eat oysters or to stroll along the promenade and the beach at Salthill, - Galway quite simply has something for every taste and interest! You can visit the city’s sights, go hiking in the surrounding beautiful countryside, or try out a huge variety of sports. The beach at Satlhill is just 2km from the city centre and swimming, sunbathing, sail-boarding, snorkelling, sea angling and high board diving can all be tried out here! Be brave and swim in the Atlantic Ocean! The school also organises regular weekend trips to the capital city of Dublin, as well as visits to museums, exhibitions and places of interest in and around Galway, such as to the charming heritage town of Westport, to the beautiful coastal town of Sligo as well as nature walks in Connemara and trips by boat to the Aran Islands! 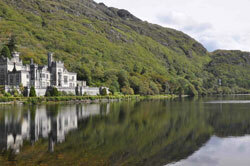 It is easy to travel to Galway by bus or train from all airports in Ireland. You can book an airport transfer on your arrival into Dublin airport, however, this is not included in the course fees. Please contact us for any further arrival queries you may have.